We are instructed to offer this 2-bedroom apartment to let. 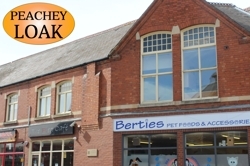 The property is one of three flats situated over shops in the heart of the attractive Northamptonshire town of Higham Ferrers, close to local schools, post office and other facilities. The town of Higham Ferrers boasts a busy town centre and has a full range of schooling. The Rushden Lakes shopping and leisure complex is about a mile to the west. The apartment has an electric heating system and will be provided with floor coverings, curtains and light fittings. The flat is available now. Entrance Hall, Kitchen/Diner, 2 Bedrooms and Bathroom. Mains electricity, water and drainage are connected to the flat. We understand the property is within Council Tax Band A. The flat is available on an assured shorthold tenancy for an initial period of 6 months. The rent of £620 will be payable monthly in advance and a deposit equivalent to one months’ rent will be required. The Deposit will be held by the Deposit Protection Service for the duration of the initial tenancy and any continuation. Upon acceptance of an offer prospective tenants will be required to pay a Holding Deposit of £140. They will be required to complete a reference check form and prove they have the Right to Rent. The Landlord will then have 2 weeks (or an agreed alternative timescale) in which to obtain references and decide whether to proceed. Prospective tenants should be aware that to be considered suitable they must have an annual income (or combined income) of at least 2.5 times the annual rent (ie £18,600 pa). If not they will be asked to provide a guarantor who does have an income of this level. The holding deposit will be returned in full (or used as part payment of the first months rent) unless the prospective tenant(s) has provided false or misleading information, fails a right to rent check, withdraws their interest in the property or fails to take all reasonable steps to enter a tenancy agreement and where the landlord (or his agent) takes all reasonable steps to do so. The property is available for viewing via the sole letting agents Peachey Loak Chartered Surveyors. Tel: 01933 403233. 4) Items shown in any photographs are not necessarily included within the tenancy.